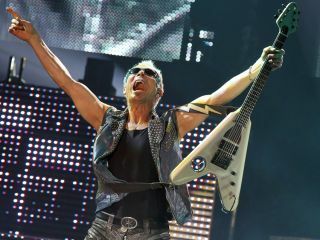 Scorpions guitarist Rudolf Schenker is a mass of contradictions. To hear him tell it, the band's new album Sting In The Tail, is their final album. But then it's not. So what's true and not true? "I know this can be a very confusing time for our fans," says Schenker, 61. "We've put out this new album to rock the world, because rock is the international language. But people want to know how long we'll be rocking. That's something I find hard to answer." So there he goes again. Schenker, who along with singer Klaus Meine, lead guitarist Matthias Jabs, drummer James Kottak and bassist Paweł M ciwoda, is currently in the midst of the the band's Get Out Your Sting And Blackout Tour, says, "This is a chance for us to say a big farewell to all the fans who have supported us for so many years. We're a point now, in 2010, when the fans want to rock hard, and the Scorpions are the ultimate band to give them the party they want." So the band is on their farewell tour. What led to the decision to pack it in now? "No, no, no. We're not packing it in." Wait a minute. I thought the whole campaign behind Sting In The Tail and this tour was that the band was saying farewell. "Well, we're not retiring. See, we only want to use the wave - ride the huge wave, you know? Classic rock is back again, and that's the Scorpions. We know how hard it is to go up against trends. In the '90s, it was grunge, and that was a monster we couldn't fight. We had a difficult time being heard when everybody was being grunge and didn't want to play their instruments. But now, as I say, classic rock is back and it's bigger than ever, so it's a perfect time for the Scorpions. "We're now what's happening. Look at bands like Metallica. When they began, they were trash and they couldn't play their instruments. But over the years they became a classic rock band because they learned how to play, and they play extremely well now. So we're just like Metallica - classic rock! We fit in right with that. It feels good to be a part of what's happening again. We've made the right album at the right time, and we want to go out on a high note." OK, so you say you're not retiring. But then you say you're going out "on a high note." You seem to be saying two different things. "I don't think so. We won't do another album. After this album…this is the last album. We are finished making new albums." All right. No more tours, no more albums. So this really is farewell? "There will be some things that can be released. There is plenty of Scorpions music that we haven't put out on albums, so that's always a possibility. The thing about Sting In The Tail…it's such a great record. You listen to this album and you hear the Scorpions at their best. There's no filler, it's all killer. It's not just a little bit of Scorpions; it's all Scorpions. "When we got together with our producers, Mikael [Andersson] and Martin [Hansen], they're Scorpions fans, and we decided that that we would make a record with the same DNA as Blackout and Love At First Sting. Those are the classic records and we wanted to make a classic record that could be every bit as good as those ones. Great riffs, great melodies, fantastic vocals and the guitar playing that Scorpions fans love - that's what Sting In The Tail has. We're so happy to be bringing this new record to the world." "I think so. Yes, it was. The bass, the guitars, vocals, drums, backing vocals, it was very easy for us. Our last record, Humanity: Hour 1, which we made with Desmond Child in Los Angeles, that was a good record to make. But then Linkin Park came out with a record that had the same message. What could we do? The damage was done. So with Sting In The Tail, we said, 'There's no reason to make Humanity 2. Let's rock! Let's have a party!' And there's only one way to rock - which we do on Sting In The Tail." It's interesting you emphasize "rock," because four songs on the album have that word in their titles - there's Raised On Rock, Let's Rock, Rock Zone, Spirit of Rock. You guys aren't being subtle on the whole "rocking" thing, are you? "We're not subtle, because we rock. Scorpions have always been at their best when they're rocking." "No, we're not subtle, because we rock. Scorpions have always been at their best when they're rocking, and that's what our fans all over the world want us to do. Let's rock! It's the message that must be brought out over and over." Now, you started the band in 1965. I've checked my facts and I counted 14 ex-Scorpions members. Can you name them all? "I think I can. Yes, I know them." "Did I? Well, there was Jurgen [Rosenthal], Wolfgang [Dziony], Ken Taylor, Ingo Powitzer…Rudy Lenners…I think that's it." Pretty good, but you left out two. "Oh, wait. Barry. Barry Sparks and…Ralph [Rieckermann]. Is that it?" Amazing! You got them all. [laughs] "I have a very good memory. But see, if you enjoy what you're doing, you can remember every day. You can remember every minute of every day. That's why I can remember all of these people, because they brought something special to my life." All right, smarty pants. Can you name me all of your ex-girlfriends? [laughs] "No. I know I can't do that. But back to the former Scorpions members…It's taken us a while to get to this point. But as long as we're here now, that's all that's important. Chemistry is the key ingredient. I've been very happy to have played with many, many great musicians, but to have your group, your gang, the people who you can spend time with, that's most important. That takes a while to get together." "In the '90s, people didn't care about guitar playing. They liked poppy and grunge. That's all changed." Speaking of chemistry, how would you describe the way you work with Matthias Jabs? "We work great together. Matthias and I worked very hard to come up with killer riffs on this album. We're back to the '80s, when guitar playing was seen as this incredible thing. In the '90s, people didn't care about guitar playing. They liked poppy and grunge. That's all changed. Now it's come back to great guitar playing, and Matthias and I spent a lot of time putting out only great riffs and leads." When you're done touring on this record, what do you plan to do? "We're not thinking about that. We want to rock with all of our fans around the world. We're excited. It's good to be excited. Our fans will have a great time and they'll rock. They'll rock till the farewell, our last concert." Are you and your brother, Michael, going to work together at some point? "Yes, absolutely. We're going to do a Schenker Brothers album. It'll be great for all the fans who have been wanting us to work together. I think we can do some very interesting things, the two of us." You're known for playing Gibson Flying Vs, but were there any other guitars you used on the new record? "I have many great guitars to choose from. I have a very old Gibson [Les Paul Junior] TV guitar, which is quite rare and fantastic sounding. And I have a very old 1959 Flying V that is fantastic. It went from Speedway to Joe Walsh to Pete Townshend to me. It's amazing and very rare. This one I played on a few cuts. When you play guitars as great as these ones, you have to consider yourself quite lucky." Recording is very different than when the band started out. How do you feel about the changes in technology? "It is very, very different, yes. One very important change is digital recording. When we started this record, we did things digital, which I feel is a mistake. It cuts off parts of the sonic signal which you really need. It's not warm. Yes, you can manipulate the digital recording easier, but that doesn't make it better. "I love analog recording - it just sounds wonderful. Bigger than that, when you record to analog, to tape, you have to wait for that magic moment. And you never know when that magic will happen. It could be the first time you play something or it could be a thousand times later. The difference is, analog is feeling and digital is power. I'll take feeling any time. And feeling is power, so there you go."